Chicken (ground with bone), chicken liver, chicken gizzard, natural tocopherols. 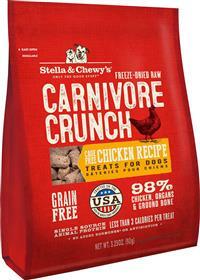 I bought these to use as training treats, toppers on my puppy's kibble, and to introduce her to raw feeding. She loves these, and plan on using all flavors. It is an easy way to get all the goodness of raw feeding, without having to make menu plans myself. Five Paws Up!